The Great Smoky Mountains National Park offers so much to do it is no wonder that this national park between North Carolina and Tennessee is the most visited national park in the country and since there is so much to do year round due to the Smoky Mountains temperate weather many visitors to the park come more than once a year! Since The Great Smokies Mountains National park has at least 1,800 resident Black Bears living in the national park, we suggest that you start your journey into the park by reading our Black Bear Safety Information Page. While close encounters with Black Bears can be dangerous, following a few basic safety rules can not only save your life, but the life of a bear as well. Once many North America Elk inhabited Appalachian Mountains and other regions throughout the eastern US, but over hunting and loss of habitat to man eliminated the last Elk long before the 1900's. 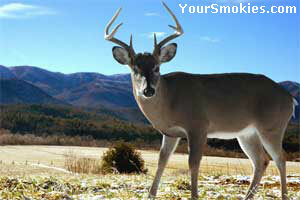 The national Park service has reintroduced 52 elk back into the Smoky Mountains starting in 2001. Found out where to see these majestic 500 to 700 pound creatures who are roaming freely in the park and what safety rules to observe on our Elk in the Great Smoky Mountains page. One of the most popular pastimes in the National Park and all throughout the Smokies is Hiking. Trails are available for hikers of all skill and age levels. Learn more about this wonderful outdoor activity on our Smokies Hiking Page. Enjoy beautiful scenery and fresh air year round and who knows, get in shape and maybe lose a few pounds while hiking! Fishing in the streams, creeks and rivers that are throughout the park is another very popular pastime drawing anglers from around the world to try their luck. It is important that before you go fishing in the park that you know the Great Smoky Mountain Parks Fishing Regulations. Whether you rent a horse in one of the parks stables or bring your own horse to the national park you are sure to have a good time on the more than 550 miles of horse trails in the park. Your Smokies has information on camping with horses in the park and horseback riding regulations. Not willing or able to ride a horse on your own? Well you can still enjoy the parks equestrian experience by taking a horse drawn buggy ride through Cades Cove. 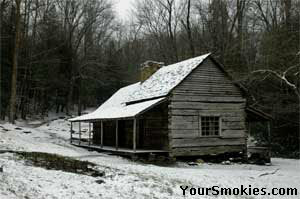 Ogles Cabin in winter in Roaring Fork GSMNP. Hybrid Park Service Vehicle in Cades Cove TN. In the Your Smokies Great Smoky Mountains National Park Handicapped Accessibility Guide there is information on visitor centers accessibility, handicapped parking, motor trails, nature and hiking trails, campgrounds, horseback riding, horse camping, picnic area accessibility and other park activity's accessibility for persons who are disabled. One of the most amazing sights in the Great Smoky Mountains national park occurs each late spring when the Smokies Synchronous Fireflies / Lightning Bugs in the Smokies emerge in the GSMNP and show off their stuff with the worlds most amazing light show nature has created. See what thousands a day, make that night, come out to see! Though not a danger to humans, the parks largest exotic invasive species is the wild hog. Besides being a threat to plant and animal life in the GSMNP, a significant number of the Wild Boar in the Smokies also carry a deadly disease. This small exotic insect is considered by scientists to be the greatest threat to the National Park today. Find out more about the Hemlock woolly adelgid and what you can do to help. The park system is seriously under funded and need volunteers to help with education, cleanup and maintenance as well as needing lots of funding. Help by joining the Friends of Smokies. Find out more about how this great organization makes the countries greatest national park even better by visiting our Friends of Smokies page. 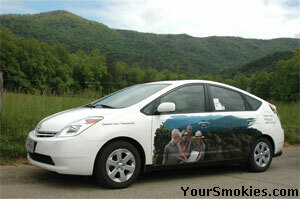 A Your Smokies Decal to show your support! For a limited time you can pick a decal for Free at Smoky Mountains Grocery on Wears Valley Road in Wears Valley Tennessee or you can get one by mail for $1.95 (shipping and handling included). On our Great Smoky Mountains National Park Service phone numbers - contact page you will find phone numbers, links and contact information for the GSMNP's campgrounds, visitor centers, enforcement rangers, horseback riding stables, the national park service headquarters main number and information for organizations that work within and support the Great Smoky Mountains National Park. There are 2 live web cameras in the Smoky Mountain National Park that you can view year round. Watch spring unfold, the fall riot of colors in the tress and bushes, and when frost or snow blankets the ground in the winter. 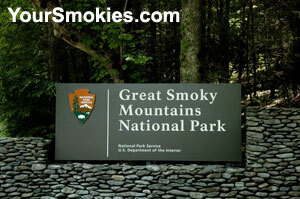 The first Great Smoky Mountain National Park Web Cam is located in the south east corner of the park in North Carolina on Purchase Knob at Maggie Valley and the second is located in the south west corner of the park in Tennessee within a few miles of Cades Cove on Look Rock on the Foothills Parkway West. 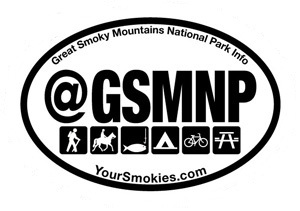 We at Your Smokies strive to offer you our reader the most up to date information on the Smoky Mountain National Park and the surrounding areas in the Smokies, the Official Park Service web site is a great resource worth checking out.